Tragic news today about the death of a former pupil of mine at St. Mary’s College, Southampton: Jack Dowding who passed away yesterday at the age of 20. Jack was one of life’s good guys, an effervescent little bundle of energy and enthusiasm whose infectious good humour always left you with a smile on your face. God love him + grant him eternal rest. An article in the Liverpool Evening Echo. 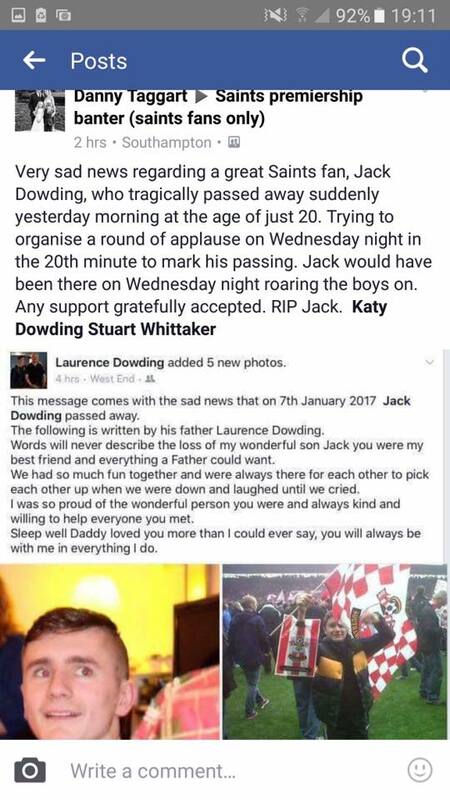 God love you Jack Dowding!!! Your applause started 30 secs early :-) Bet you enjoyed that goal!! I was at the funeral in Hedge End, Southampton yesterday of our former St. Mary's pupil, Jack Dowding, who had the 20th minute applause in his honour during the first leg... a very moving service, the coffin decked in Saints colours, and you can guess what one of the hymns was... #OHWHENTHESAINTS !!!!!! He is certainly now "in that number" with the Saints in heaven.